I love a great denim dress! It is such a classic. I have had this one for several years! I love that I can dress it up or down! What are your favorite ways to wear denim? Spotlight: Our spotlight of the week is Brooke of Pumps & Push Ups! 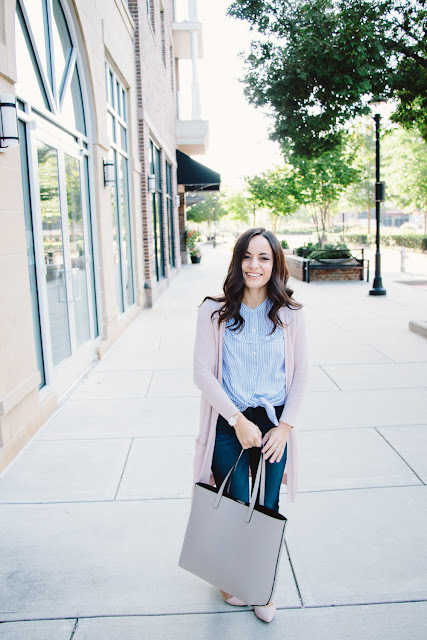 How perfect is Brook's blush cardigan! This is an outfit that I want to copy! Such a perfect transitional look! Be sure to check out her blog! This is adorable! I love the denim dress with the booties and hat. Denim dresses are just the best and you are so so cute!! LOVE the color of that hat on you!! 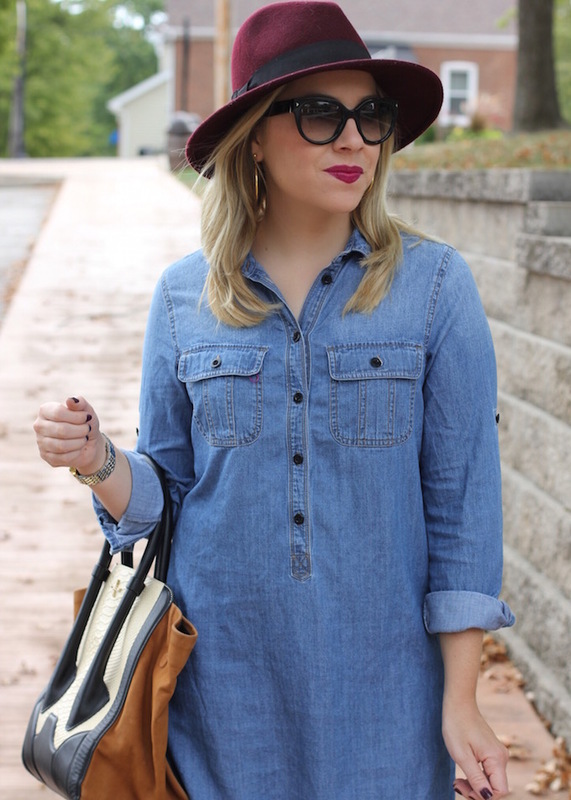 This is such a cute denim dress on you and great hat! Thank you so much for featuring me!! :-D I love or cute hat and booties!! what a cute fall look. Love the denim dress. So cute with those booties! I love this denim dress, Jacqueline! But that purse is the best too!! Love chambray dresses for fall. Yours is styled beautifully! Great booties! Ooo you're reminding me of a denim dress I have in my closet! Love the hat, too! 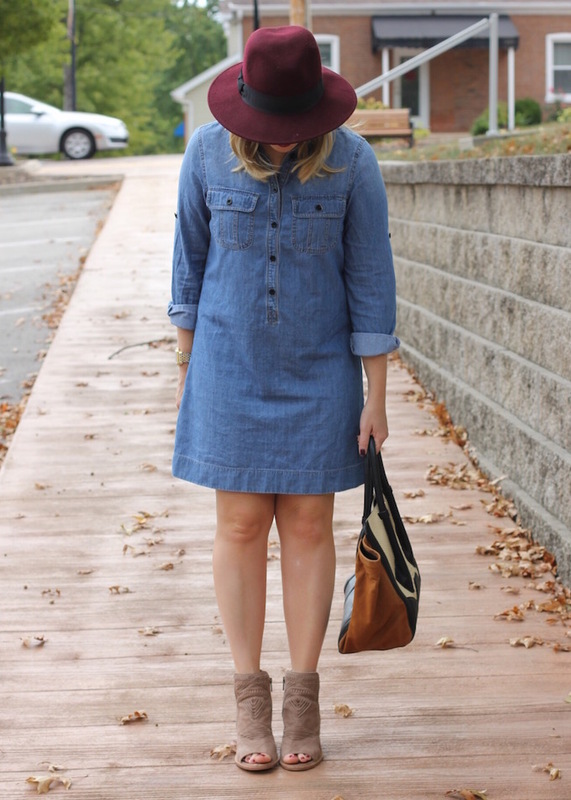 Denim dresses are definitely a favorite of mine for fall! Love the booties & hat you paired it with too! This is such a cute fall look! 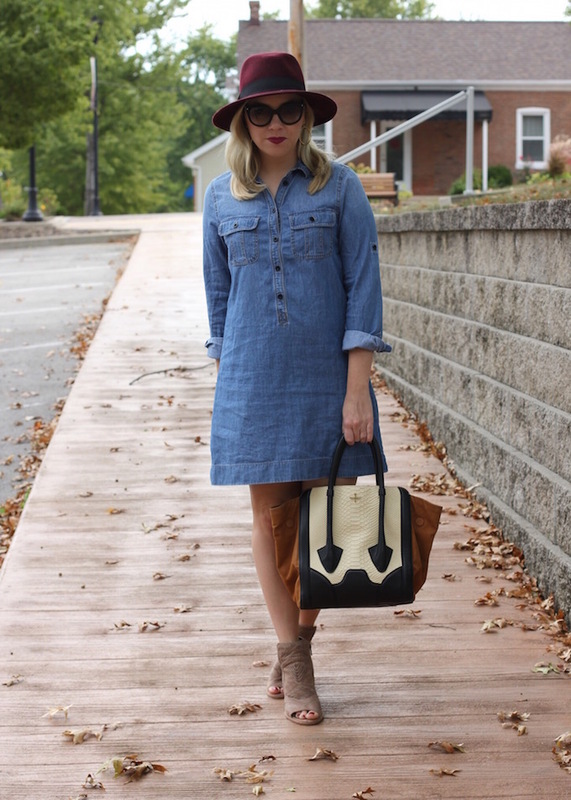 I love the denim dress paired with the booties, and I'm obsessed with that bag! You look ready for fall! You have some of the best accessories for this outfit. I'm loving that bag! This dress is so cute with the burgundy hat and I also love those sunnies! That dress is darling and I LOVE that hat! I love that dress! 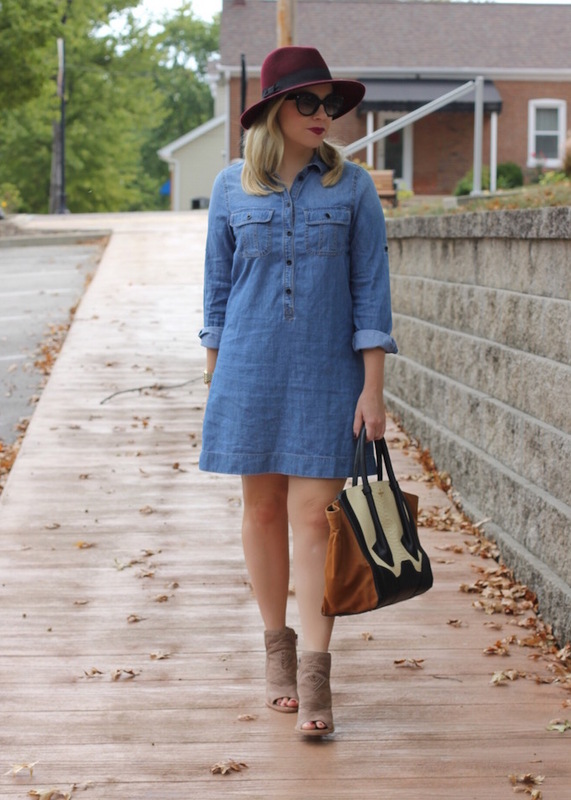 Nothing like a good denim shirt dress! Those open toe booties are so cute with it! This dress is so fabulous! Love how you styled it with booties and a burgundy hat, perfect Fall look! That chambray dress is a classic! Love how the hat adds to the look! Perfect denim dress. I'm still on hunt of a one.